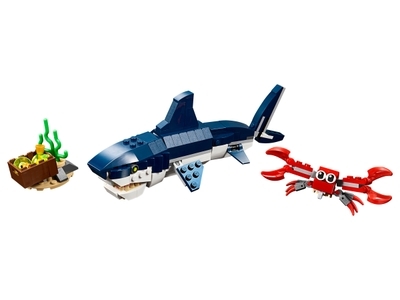 Enjoy sea life adventures with the LEGO® Creator 3in1 31088 Deep Sea Creatures set, featuring a scary shark toy with a realistic dark-blue and white color scheme, opening mouth full of pointy teeth, moving fins, movable body joints and reflective eyes, plus a posable crab with a box of treasure. With LEGO Creator 3in1 play sets you get 3 different build and play experiences. Build the Shark and crab toys, and then rebuild them to create a posable Squid or a wide-mouthed Angler Fish for even more deep sea fun. Price is 33% below the initial Lego retail price, a € 6.00 discount! This comes down to 5.21 cent per brick. The Deep Sea Creatures (31088) Lego set is available from the sites below. However, they do not offer delivery to your selected region. The Deep Sea Creatures (31088) Lego set is no longer directly available from the sites below. However, 3rd party partners of these sites might still have the set available. Alternate description Build and rebuild a Shark, Squid or an Angler Fish with this LEGO® Creator 3in1 Deep Sea Creatures set! Check out the Shark's cool dark-blue and white color scheme! Open the Shark's mouth to reveal its scary, pointy teeth.